1611 • The King James Version of the Bible published. 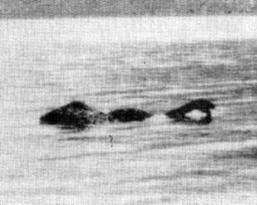 1933 • Loch Ness Monster Sighted. 1936 • Manuscript of Edna St. Vincent Millay’s Conversations at Midnight destroyed in hotel fire. stalwart alert • Barstow College to carry Manga: 60 Years of Japanese Comics, was was banned from the San Bernardino County libraries due complains about sexual images. mitzvah • The first donations of nearly 90,000 quality English language books were handed to over a first group of Thai schools and students affected by the tsunami. what will they think of next? • Not only does ABE wants to save us the trouble of actually storing or selling our books, contacting or corresponding with the customers, processing our own orders. Now ALIBRIS wants us to GIVE away our books and skip the whole process. WOW! ain’t that clever of them city fellers? and us just a dumb ol’ hick booksellers who don’t know how to do nothing bout selling no books. they shoot dead horses don’t they? • news flash! more ‘Opal Mehta’ passages found to mimic additional authors and Opal Mehta will NOT be reissued and the 2 book deal has been cancelled. EDIT- Now we are truly beating a dead horse. Of COURSE you were gonna find more and I dare say they are going through everything this kid ever wrote for every class assignment back to Pre-K. This is all COMPLETELY understandable now. She’s one of those National Honor Society students…They get spectacular grades because of the way their brain works. They ingest everything they read and regurgitate it whole or in chunks – on demand. No digestion involved. So I say we give it a rest at this rate this kid is gonna implode and jump out a dorm room window. She didn’t even get to keep enough of the advance to pay for the college education which was supposed to teach her to think thoughts of her own. event • OR Charles Seluzicki of Charles Seluzicki Fine and Rare Books will be signing Charles Seluzicki : 30 Years as a Fine Press Publisher at the Central Library in Portland.